MoarBooks, a Manila-based indie press that advocates independent publishing, provides a venue for talents to be recognized and shared, is the brainchild of all-around Superwoman Wina Puangco. 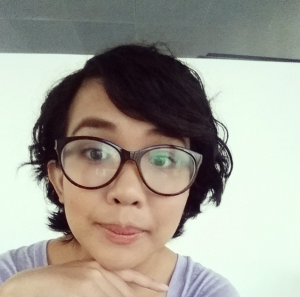 Here she talks about how it started, her favorite books and her thoughts on reading in the Philippines. Wina Puangco is a writing wonder. Visit her at Wonder Stories and MoarBooks. Hi, Wina! Congratulations on MoarBooks. Can you talk a little about how it came to be? 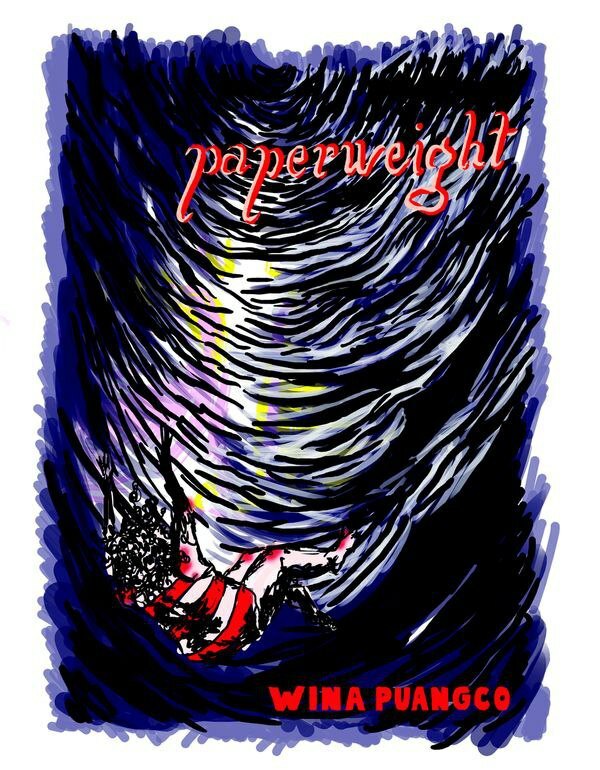 After I launched my self-published book Paperweight in 2012, a compilation of tiny fictions following a narrator who lived in the city, a lot of people were repeatedly asking me where to get it. That’s when I thought, “Okay, why not create a website where these things can be available after events?” After that, I got MoarBooks a home online and started looking for other people’s projects to publish. A big part of MoarBooks was meeting Adam David, founder of Better Living Through Xeroxography (BLTX): A Small Press Expo, which encourages local creative people to showcase their work. Through BLTX, I met a lot of great people who really changed how I saw the book and publishing industry. Given the number of independent, let alone mainstream, presses in the country, a lot of people don’t really know what they’re about. How does MoarBooks work? How do you choose the projects that you publish and sell? We find titles to publish two ways: one is by pitches that we receive from writers and artists and the other is by discovery through attending events and meeting people. Interaction with the writers and artists is a major part in our selections, but we also look at how seamless and cohesive a project is and how well the content fits the form and vice versa. 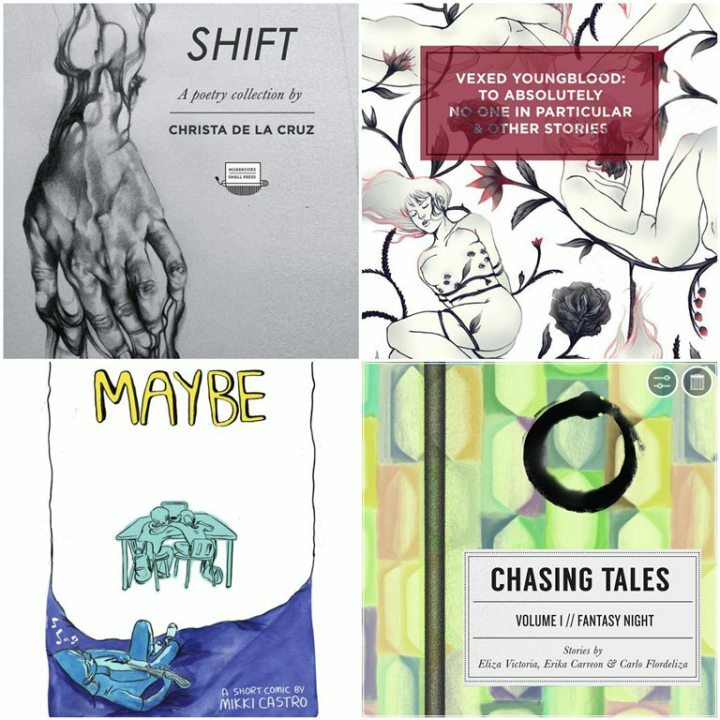 So far we’ve published five titles: Paperweight by yours truly, Shift by Christa De La Cruz (poems), Vexed Young Blood: To Absolutely No One In Particular & Other Stories by Noel Villa (short stories), Maybe by Mikki Castro (comics) and Chasing Tales, Vol. 1: Fantasy Night by Erika M. Carreon, Eliza Victoria and Carlo C. Flordeliza (short stories). Shift by Christa De La Cruz did really well for two reasons: Christa’s work is amazing and the book has a unified feel, and is immediately arresting because the cover art gets that across. The poems are air-tight, and talk about something we can all relate to—that is, how volatile and fleeting everything is. Maybe by Mikki Castro sold out all in one day. I think that had a lot to do with the medium of the work, as much as it did the content. Basically, Maybe is a comic that tells a love story between two college students. Mikki was able to tell that story very well—despite being something ‘typical’ or very ‘easy’ to get wrong, using dialogue and images that made that old concept refreshing. Vexed Young Blood: To Absolutely No One In Particular & Other Stories by Noel Villa has oddly enough, been quite popular in Mindanao. The title story, To Absolutely No One In Particular, is about a guy who falls in love with his own drawing. It’s simple, but amazingly written and hits you where it hurts. To a certain extent, all of us “fall in love” with the things we make. Right now, we are absolutely, completely out of stock save for four books currently on consignment at Uno Morato, the café and independent bookstore, so it’s hard to pick the bestseller. We saw on your website that MoarBooks is running a Go Fund Me campaign. Can you talk more about this and the feedback that you’ve received so far? Oh, Lordie! Go Fund Me came about as a result of really needing to up the supply. We’ve gotten a couple of donations, so far, and I’m really appreciative of that. My biggest fault maybe is that it’s difficult for me to think in terms of “pitching ideas” and “looking for a market,” so I kind of base it on what I feel would interest me. Obviously, money is important but I think that most people have it backwards: don’t make books to make money, make money so you can keep reading. Where do you think MoarBooks is going? [The goal is] to make more books and collaborate with more people. We launched an art book last February. 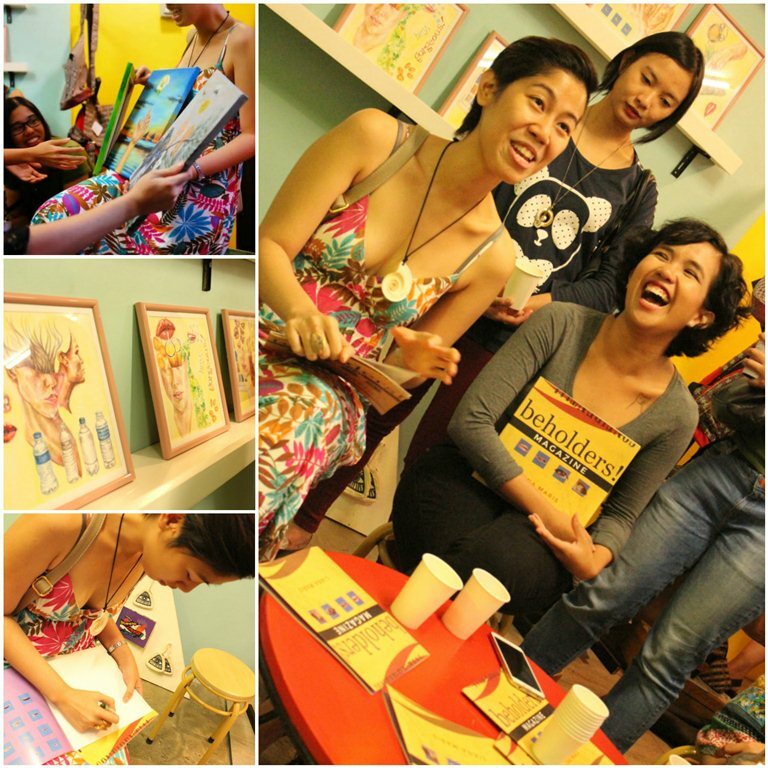 It’s a collage book titled Beholders by Lia Sangalang, an artist whose work, both her drawn and painted art and collages, is extraordinary. What are your thoughts about self-publishing versus traditional publishing? On the other hand, there are the big publishing houses that are academic and the connotation seems to be either be “good” or “irrelevant” work. That association is dangerous because it teaches people that good work equates to inaccessible, esoteric work. Neither of those things are necessarily true, but that is the common person’s perception. But oddly enough, I think that both sides need each other. The raw, interesting material will often be found in the dinky, hole-in-the-wall events and the big publishers will have the resources. The latter just need to participate more in the local literary scene and find talent outside of the circle of “award winners,” while the people in the indie publishing world need to improve themselves by seeking learning opportunities, doing the legwork and seeking critique. We shouldn’t be afraid of constructive critique; after all, it is a very powerful form of compassion. If you’re a self-publisher, put your work out there and talk to people—if you did the work to make sure that what you’re putting out there is good, it would be a shame to keep it to yourself or to have it not be read by others. Speaking of keeping improving one’s self, you recently launched another book last January 17. Congratulations! Can you take us through the journey? Yes! 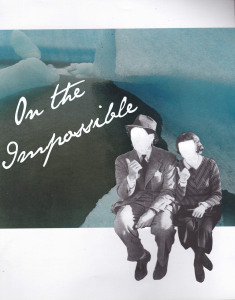 On the Impossible was a good way to begin 2015. It’s a book that explores the concept of being in love with the absent through found objects: notes, postcards, hypothetical questions. [The idea] began with a conversation with one of my friends over Skype where the said friend mentioned enjoying hypothetical questions more than their answers. Eventually, I got to listing down a bunch of questions I found interesting and built a narrative from there: What does asking these questions imply? What does this say about the two people engaged in that non-existent conversation? The book is 100% handwritten, with beautiful art inserts by Arabella Paner, whose work is gorgeous. EVER? It changes, of course, but I will probably have to go with (if we’re talking about a book – I’ve been reading a lot of short stories at the moment) Possession by A.S. Byatt because she works with elements that are basic (love, intrigue, unlikely situations) and ties them into a narrative that just won’t let you go. Why must you ask me these difficult questions!??! Haha, kidding. If I had to pick just one I would probably say Donald Barthelme for his skill and for the wit and charm that his writing has.